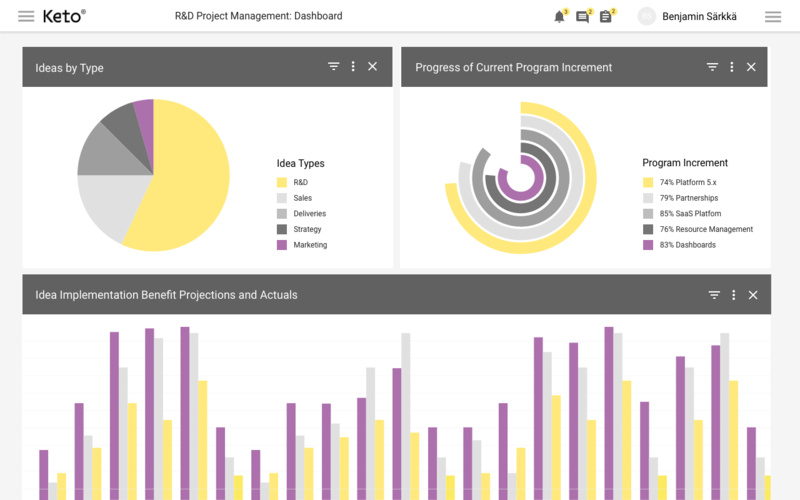 The Keto Platform for Innovation and Development combines idea, project portfolio, resource and risk management in one simple to use tool. Ideas and project proposals can be evaluated based on various metrics, and the best ones moved to the project portfolio. 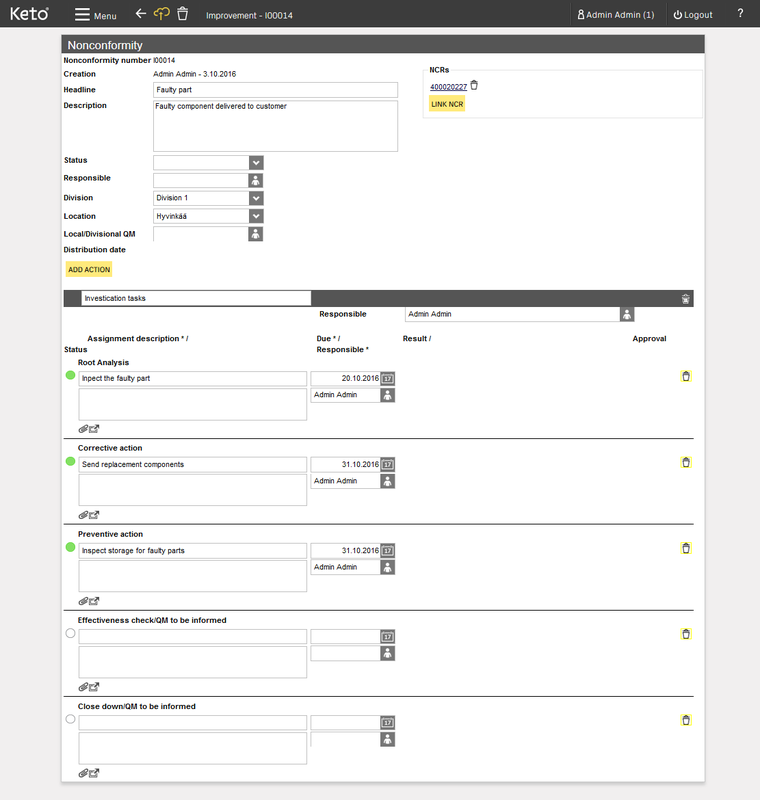 All customisable to your own workflows. Click the arrows on the sides or scroll down for more details! Ideas are not created randomly, but according to a specific need – whether it be a strategic goal or a new trend in the market. 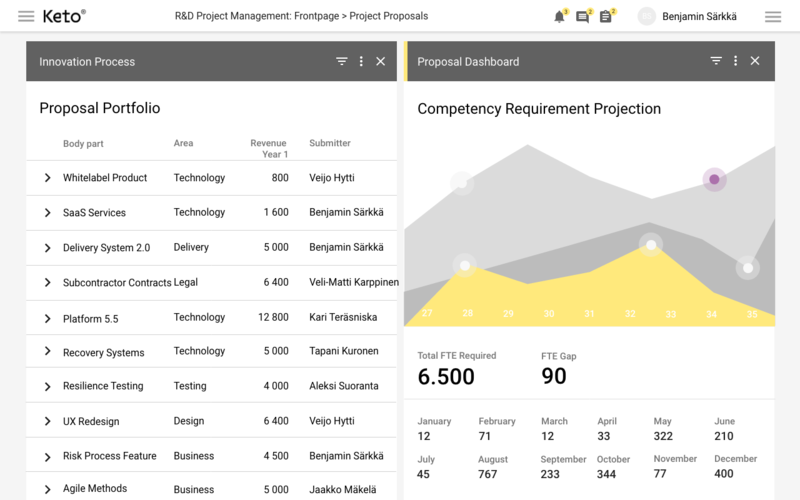 All your organisation’s ideas can be managed efficiently with the Keto Platform’s Idea Portfolio function. 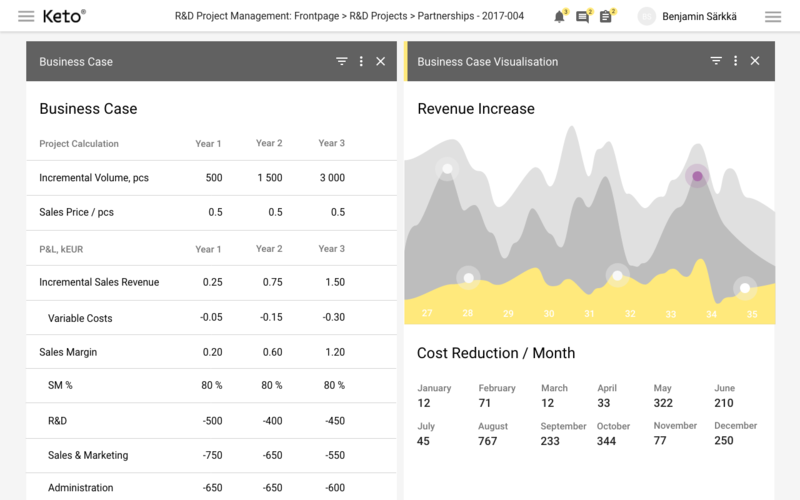 We offer tools such as evaluation matrix, business model canvas and dashboard to help evaluate and compare ideas. Choose the best ideas and move them to the project proposal portfolio. Whether you prefer to use innovation campaigns or other types of idea gathering processes, we’ve got your covered. 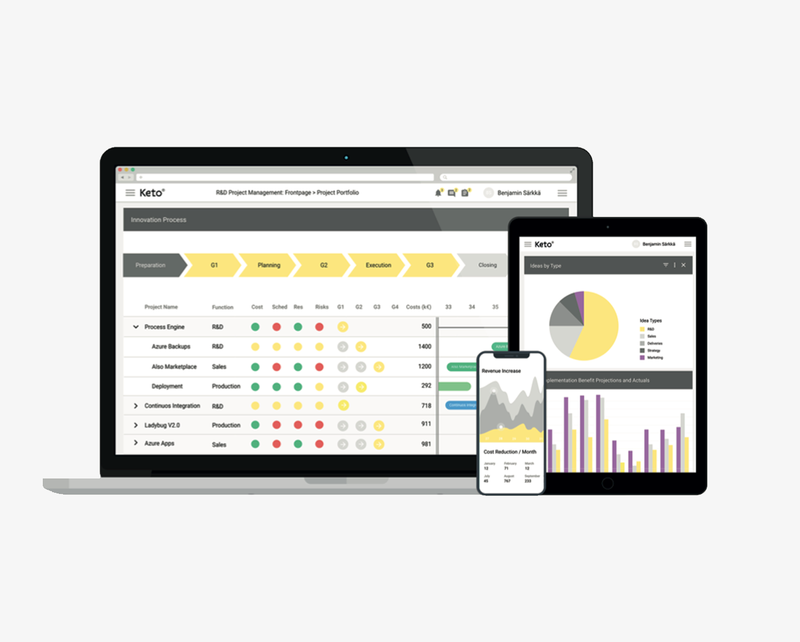 Let the user friendly Keto Platform help you standardise idea management and reporting across the organisation. Each idea can be evaluated either by the submitter or by another expert in the subject matter on request. The most valuable ideas can then be selected for further processing based on your organisation’s strategy and priorities. The content of the evaluation matrix can be fully customised according to your organisation’s needs. Selecting the right ideas to become projects is a critical task. 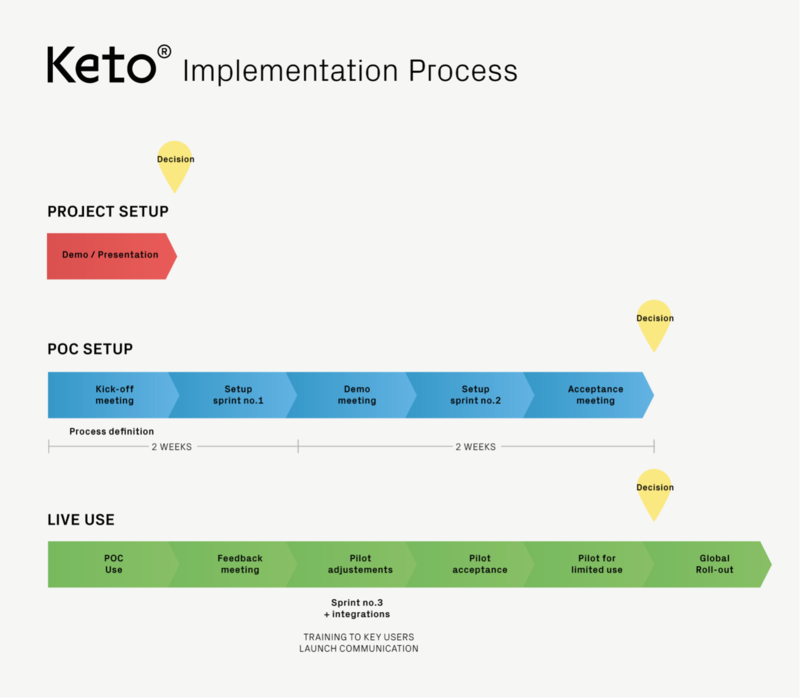 The Keto Platform offers excellent tools for planning and evaluating the potential of each idea and project proposal. We provide tools for drafting the business case for each project proposal according to the company’s specific needs such as risks vs profitability, time to market, cost-savings potential or strategic fit. Evaluate and prioritise proposals. 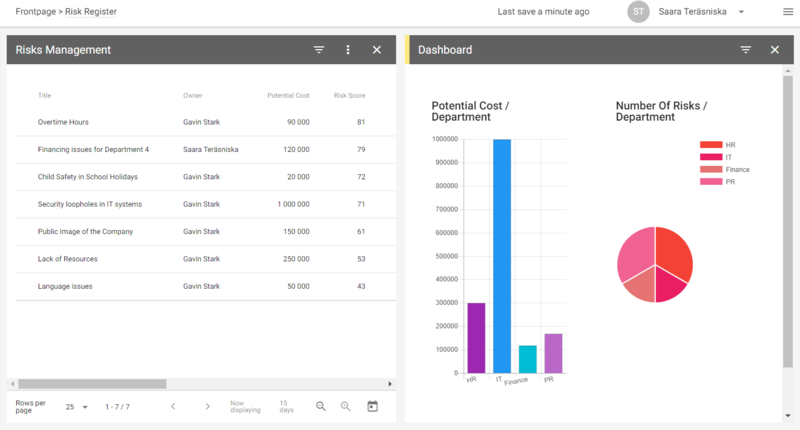 Get visual data in the dashboard view. 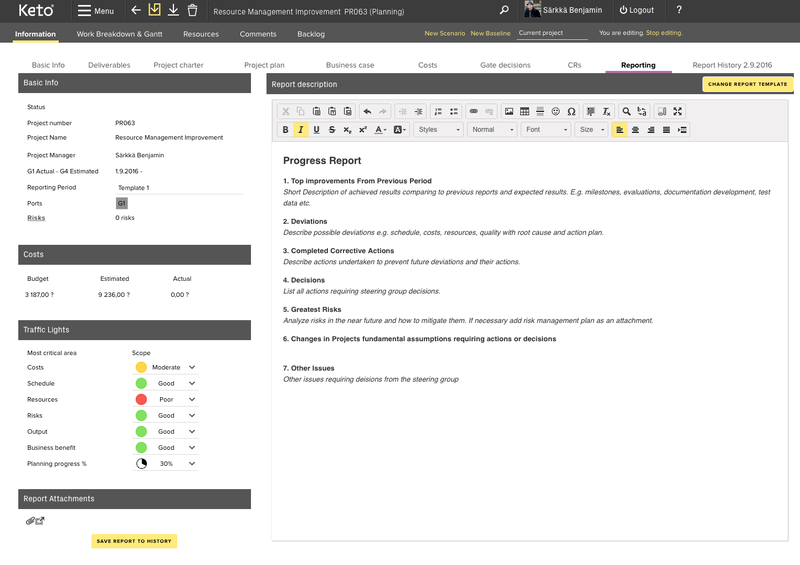 Create a business case for each project proposal with the practical planning tools. 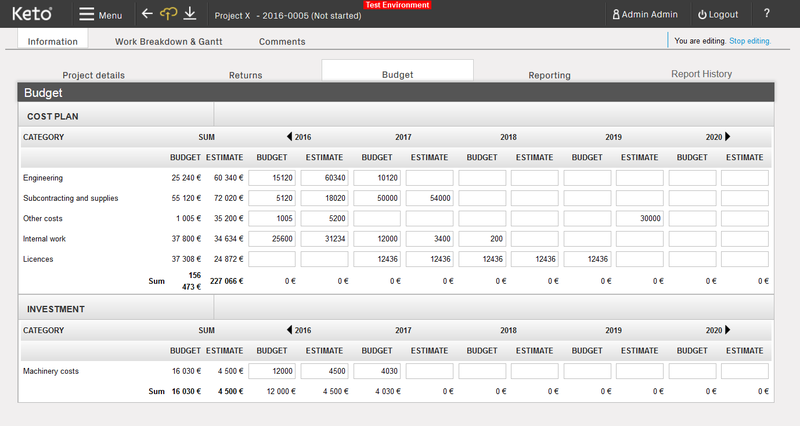 Analyse and plan the financial implications of the project proposal. Fully customisable to your organisation’s needs. After a project proposal is approved, it is moved to the project portfolio. With the Keto Platform traditional projects can be managed in the same portfolio with Agile projects. 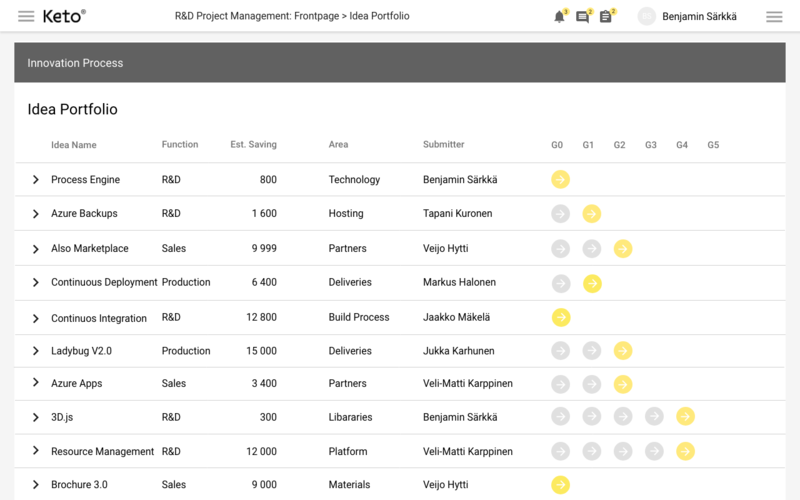 The portfolio view provides management with a real-time overview of all projects and their progress. Large organisations often have strategic programmes in place. With the Keto Platform you can customise and monitor the progress of each programme and use the data to to help make prioritisations. Most projects require detailed planning and scheduling. 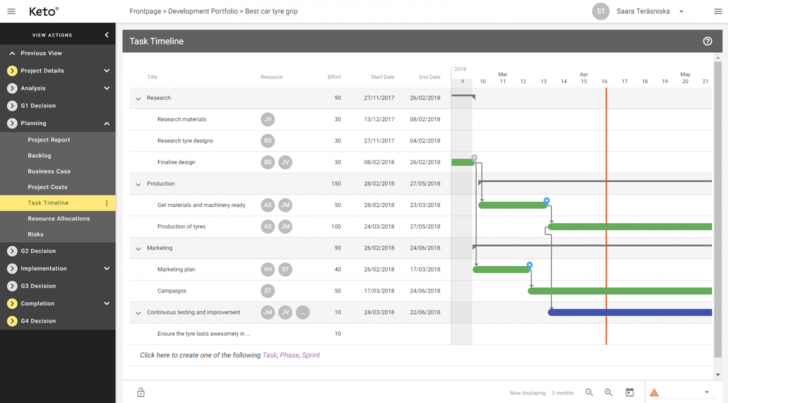 Our Gantt-type planning tools have been designed with and for the project professionals. 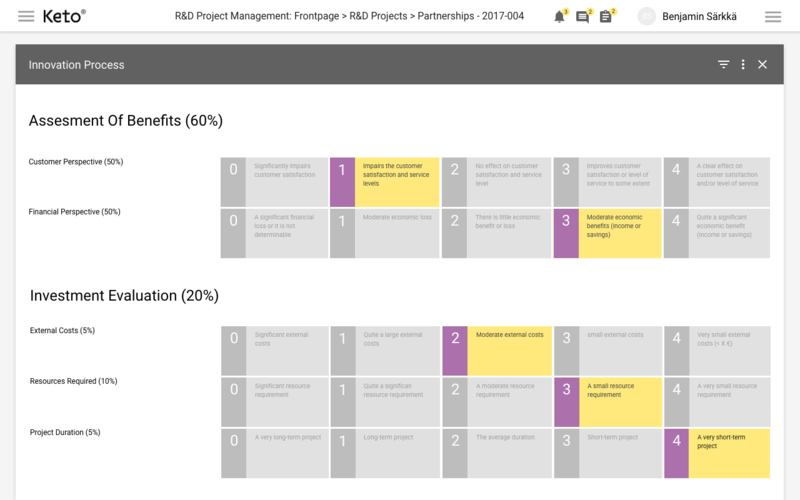 Managing a project is simple – insights on project costs, deliverables, risks, benefits and more are easy to add in and reporting is straightforward. You can enjoy a wide range of functions or simplify the usage depending on your organisation’s preferred workflows. Another special feature is easy integration of Agile and Waterfall into the same project. 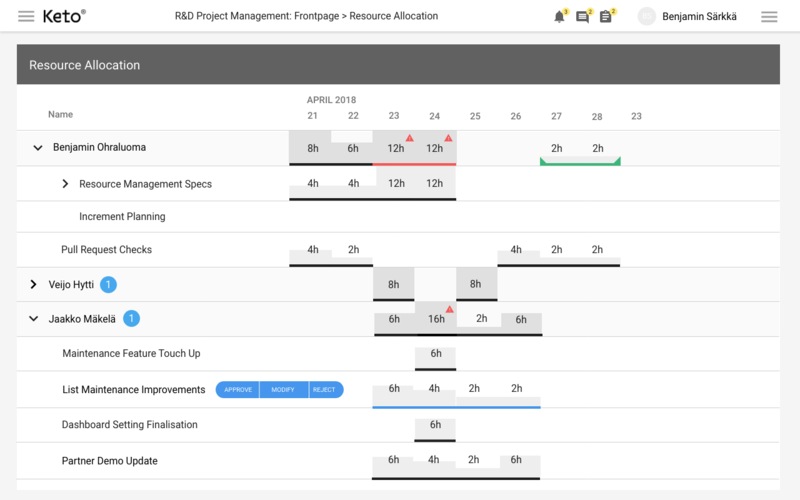 The Keto Platform is designed to give you clarity on your project management using both Agile and traditional methodologies. The strength of Agile lies within its flexibility – using a Kanban board, your team will work on the continuous development or improvement of different products or services while constantly prioritising. The work is done in short sprints rather than structured phases. 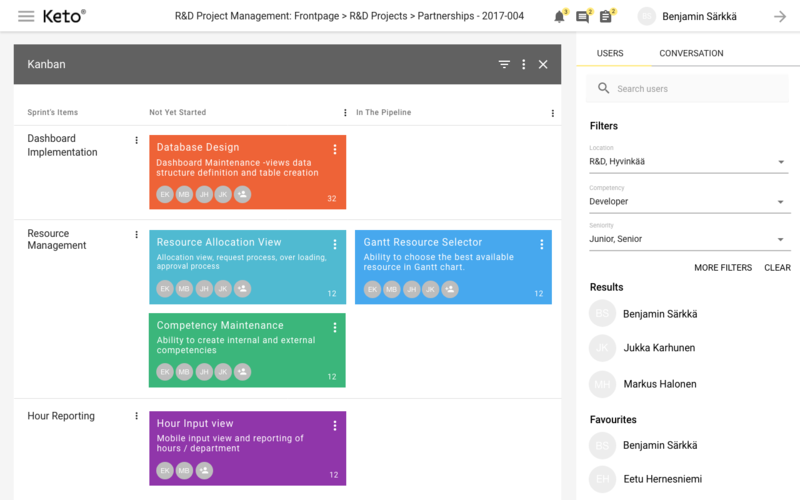 The backlog function is a dynamic list of tasks to complement the Agile process. The tasks can be divided into smaller entities to ensure easy prioritisation and continuous progress. Rather spend time efficiently than trying to find reports all over the place? With the Keto Platform you’ll have real-time reporting with all documentation in one place and accessible to the right people. 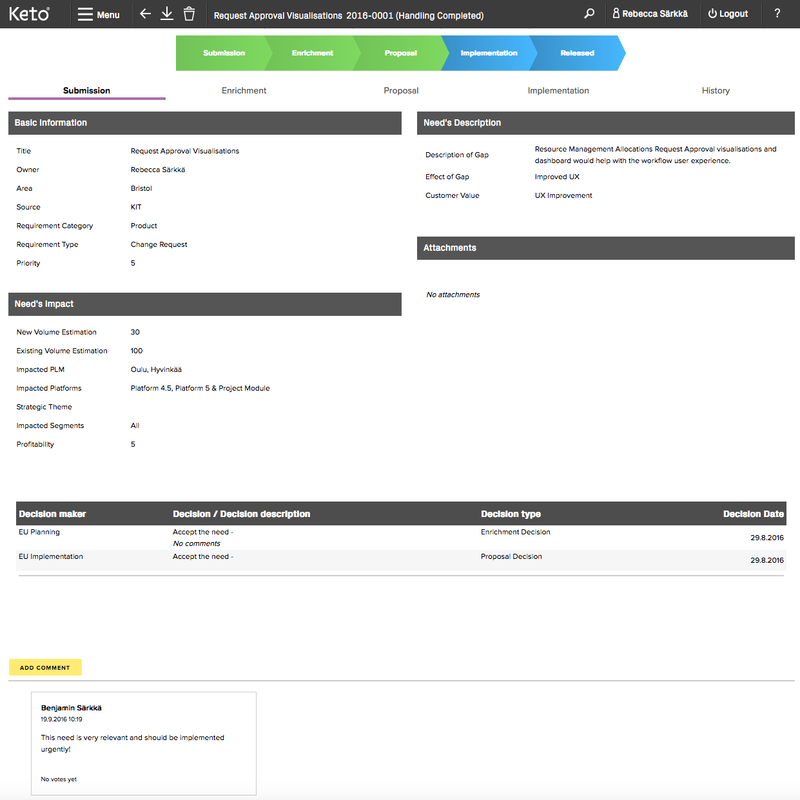 Data can be collected both from the Keto Platform and other applications through integrations, and visualised in the dashboard. Thanks to holistic analytics you can easily monitor the progress of the projects, resourcing, risks, profitability and other measures. 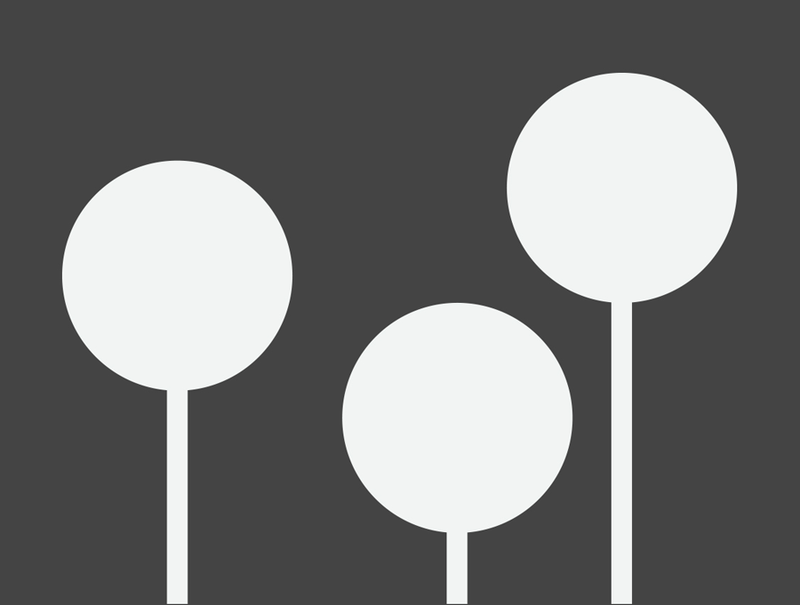 Resource allocation is a critical task in any organisation. 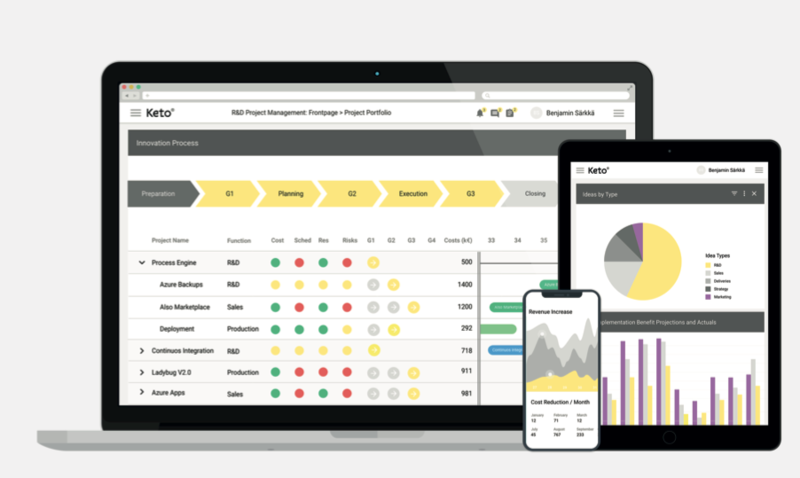 The Keto Platform provides easy-to-use tools for resource management to save time and money and keep employees motivated. This function is widely used globally. Project management often requires planning and tracking the hours. Management can easily monitor real-time how much time is actually consumed compared to the estimate, and see how things are progressing. 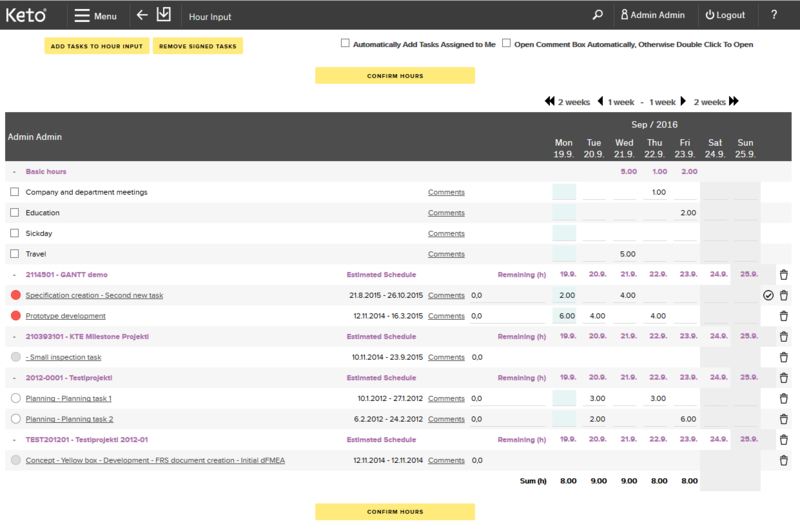 The simple to use hour reporting view helps all users report the actual work duration directly into the Keto Platform. 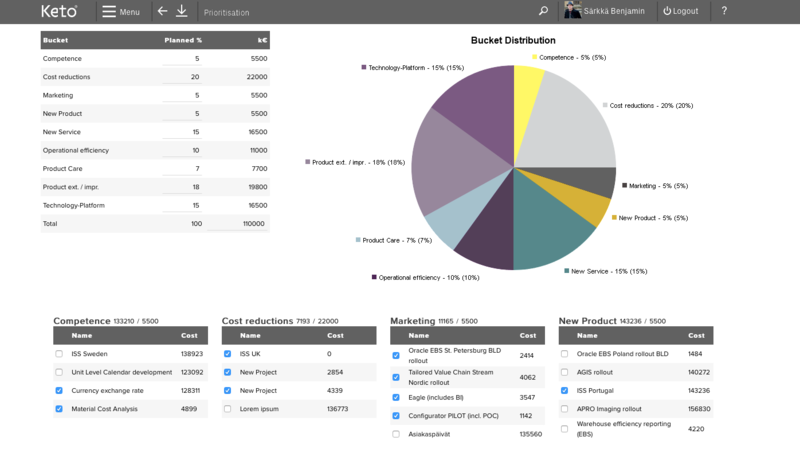 Want to know the resource load in your organisation and by each person? With the Keto Platform you get a good overview of the resource load and can plan and take action before potential problems arise. 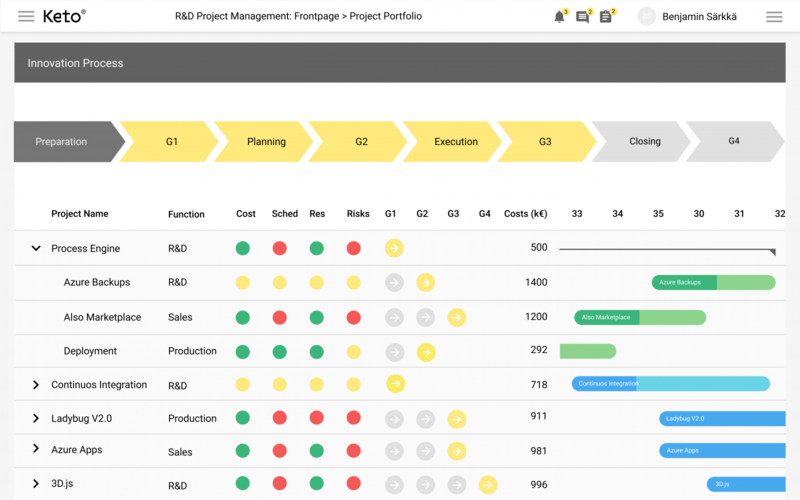 With the risk management features you can identify, categorise, prioritise and control risks throughout the entire organisation, as well as within individual projects. Budgeting is an important starting point for measuring the return on innovation investment. The Keto Platform’s budgeting feature can be adapted to your own processes and needs. Management manages different kinds of needs and requirements from clients, internal stakeholders or standard authorities. You can easily manage these needs with the Keto Platform’s request functionality. Reporting the progress and results of your audits may be time consuming and frustrating. By centralising this to the Keto Platform you can easily track the number of deviations, how they have been resolved and how the related tasks are progressing. We have optimised the user experience in mobile and smaller screens for most of the functions, especially where high efficiency is needed. We are more than happy to help you with the implementation project and continuous service. Our well-trained project managers can take full responsibility for technical implementation, training the users and keeping things on track. Ask us more about this opportunity! Order a tailor made Proof-Of-Concept with a fixed price of 7.000 €. 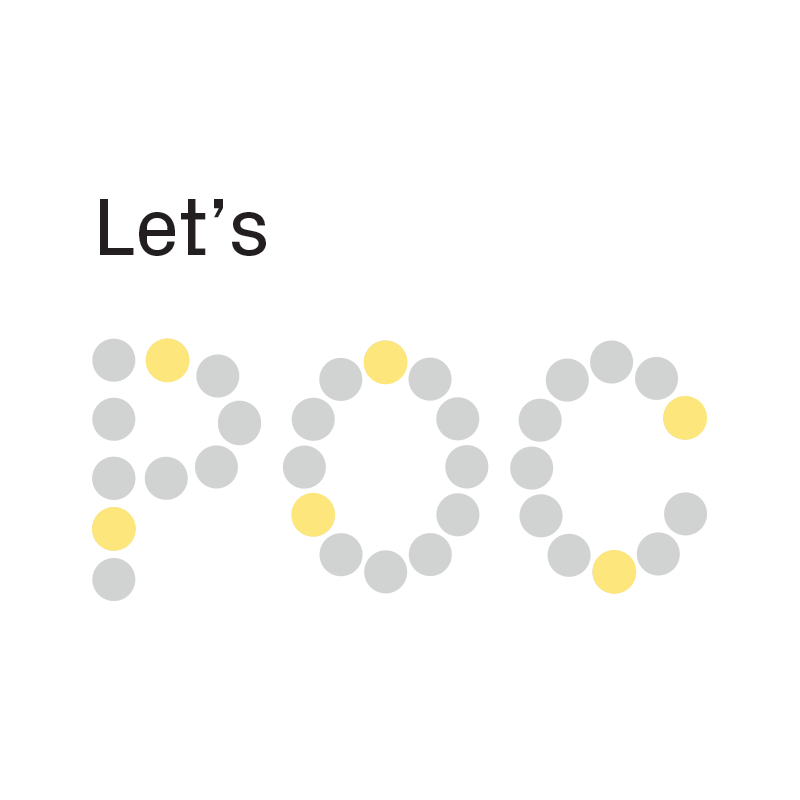 What do we mean with a POC? Fixed price EUR 7.000 plus VAT excluding travel costs if applicable – this amount will be credited when contract for Keto will be signed after POC.